Katie is an exuberant 4th grader with enormous creativity, boundless energy, and a school desk that gives chaos a bad name. You may have witnessed your child's messy school desk firsthand. When you show up at school on Parent Night, you know immediately where your child’s desk is without looking at the construction paper name tags scotch-taped on carefully by the teacher. The bulging folders, the fidget toys spilling onto the floor, and the crumpled heaven-knows-what smooshed into a crevice don’t require an FBI agent to track down the culprit. You smile wanly and try not to notice another parent casting a side-eye at your child’s crime scene of a desk. I started working with Katie (not her actual name) toward the end of the school year last year. Katie’s teacher suggested to her parents that finding someone to coach Katie on developing better organizational skills might be helpful. Organizational skills are one of the Executive Functions that are key to academic success. In our initial meetings, Katie wasn’t quite ready to change her ways at school, but she was willing to learn how to manage her materials at home more effectively. She enjoyed using a label-maker to categorize and organize items in her closet, room, and study area. Once she saw how cool it was to take control of those former disaster zones, she was ready to tackle the blizzard of clutter at school. But she was worried. It just felt too overwhelming without me there to coach her. With the knowledge that part of my bigger-picture goal was to help Katie find ways to take ownership of strategies that work for her, so she could eventually become her own coach, we dipped our toes into the challenge of organizing her messy desk. Ask your teacher to take a picture of you with your clean desk! The next day, Katie sent me a photo of her beaming and doing her best "Vanna White" to display her perfectly organized desk with a flourish. Ta dah! Finally, I worked with Katie’s teacher to figure out good ways to give Katie the heads up when one subject was ending and the next one was starting. We wanted Katie to develop the habit of using that buffer zone as the time to find the right folders, and put away old work before anything new was pulled out of her desk. 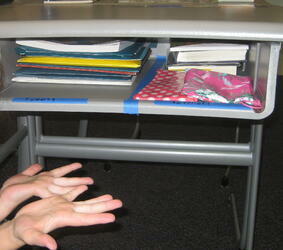 We discussed basic guidelines to maintaining the system: One folder on top of your desk at a time. A quick 2 minute sweep to tidy up before the end of the day. 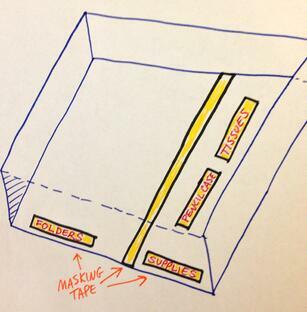 Follow the labels on the tape to maintain the zones. Katie’s teacher was instrumental in making this plan work. I think she was pleased that Katie was taking charge of this problem area without having to be constantly reminded, so she put her full support behind Katie’s efforts. And Ms. Brown learned a strategy or two to help other students organize their desks and save parents from “that look” on Parent Night. Do you know a student who could benefit from learning strategies to get and stay organized and banish that messy desk? 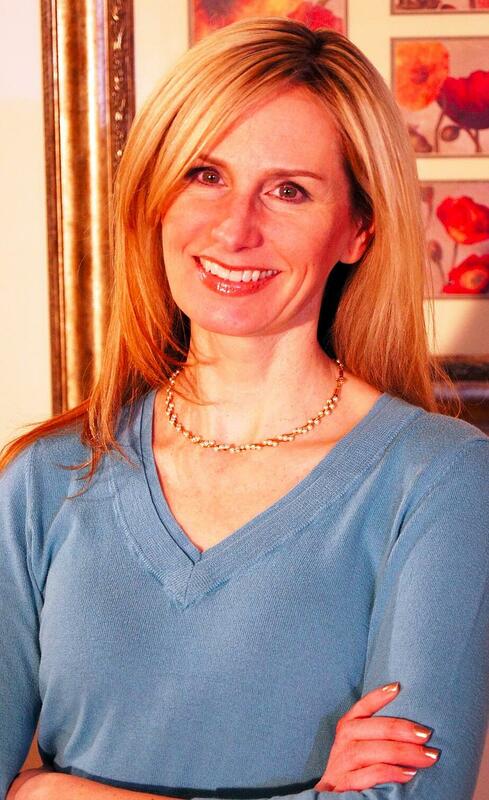 Click below to find out more about Executive Function coaching.